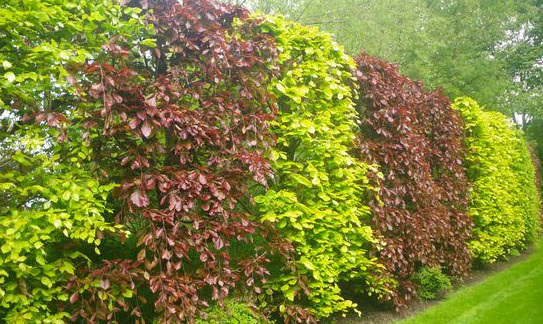 Buy online Purple Beech hedging plants for sale direct from UK tree and shrub supplier. Why Buy Our Hedging Trees? Our hedging trees are plug plants which can be planted all year round. No rush to plant as roots are not exposed. Purple Beech (Fagus Sylvatica 'Purpurea') is marked by its attractive coppery-red foliage, and like Green Beech, makes a great hedge, retaining its coppery leaves throughout winter and only loosing them when new leaves develop in spring. It can be either an attractive formal hedge or act as very good windbreak. The dark purple of the leaves contrasts heavily with shades of green in your garden or park making both more attention getting. Some people will mix the Purple Copper Beech with common Beech trees to get this effect in their hedge. As it has been resident in the UK for a very long time then Purple Copper Beech is considered native to the UK. If you forget to prune your Purple Copper Beech tree expect it to grow to at least 6 metres after 10 years. Fully mature, a Beech tree can be 30+ metres with a 25m spread but this is usually only if planted in deep, well drained and fertile soils. 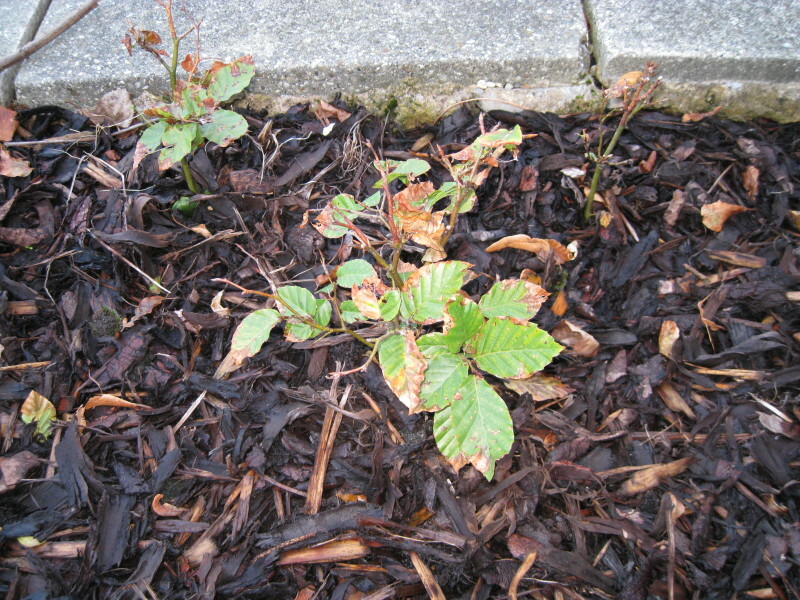 Should you find your Purple Beech tree struggling then check drainage as this will be one of the few things that hinders its vigour. Purple Copper Beech is commonly planted in parks and ornamental gardens for its particularly outstanding attractive qualities one of which is that they are long lived. Not usually planted as a barrier hedge for livestock as they tend to browse on it. Now in this day and age, that would mean that they are looking on the Internet for something. Considering this unlikely because there is nowhere in a hedge to plug in a keyboard we asked a pre-Internet person (coincidentally retired) and they said it meant to eat the leaves. Should you have a particularly open and exposed site i.e. weather and not nudist colony, then the Purple Copper Beech tree will be suitable for you. Now we mean "normal" exposed sites, not tsunami beeches or hurricane alley! 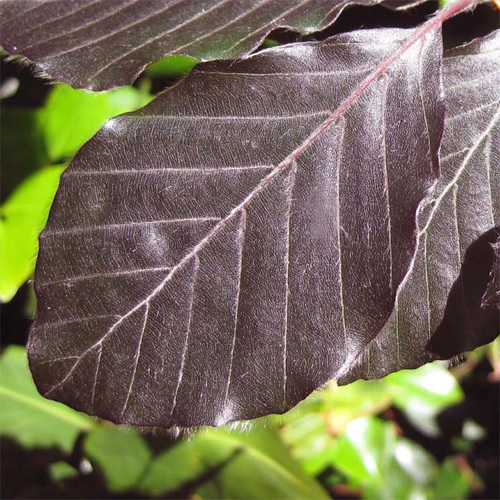 Full sun with well drained soil will give you best results as purple leaved trees are like tan addicts and do better in the sunlight however it will tolerate partial shade. This usually means a spot in the garden that has shadows cast over it for a few hours a day, not bits of lamp shade draped over it. Should you have any doubts about your soil quality then mix the excavated earth with 50% well rotted manure or compost. Purple Copper Beech is considered to be chalk and acid tolerant. Should you have particularly heavy clay and do not want to mix in more organic matter then Hornbeam maybe a better hedging choice for you. 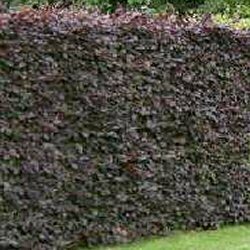 Removing grass and weeds close to your Purple Copper Beech hedge will reduce competition for nutrients and give your hedge a bit of a boost, especially in the first few years. Fagus sylvatica 'Purpurea' can be pruned hard at any time of the year without any serious consequences to the tree (other than it looking bald?). If you are wanting to keep the leaves over Winter, best to prune the hedge when dormant i.e. before March. It is this pruning that keeps the branch growth "juvenile" and therefore the leaves do not drop in winter. The flowers or Catkins of the Beech tree are considered insignificant, wind pollinated and will turn into 2 edible nuts inside each Beech pod. Do not eat too many as they are high in tannins and could cause stomach upset. If you continually prune your Purple Copper Beech it is unlikely you will see these. Fagus Sylvatica Purpurea or Purple Copper Beech is considered to be fully UK hardy, so if you are Arctic training somewhere in deepest Scotland and want to take a lucky tree, making it a Purple Copper Beech is a good choice. The Purple Beech tree is also known as Fagus sylvatica "Purpurea" or "Atropurpurea" or "Atropunicea". How many Purple Beech trees do I need? We recommend planting 6 plants per metre using the double staggered hedge method for a full and thick hedge. You can plant 3 per metre using a single row of trees if you prefer, however the gaps at the bottom of the hedge will be larger. If you cannot plant straight away, take the trees out of the packaging and stand upright next to each other in a sheltered location outside. November to March, no need to water unless they start to dry out. Any nitrogen based fertilizer will do such as 20:20:10 but the longer lasting ones which take 18/24 months are better as they are regulated by the weather and moisture therefore release slowly. We recommend planting the second line of trees 25cm or 10 inches away from the first if using the staggered hedging approach. Consider buying 10% more than you need and plant the spares elsewhere so you have immediate replacements for damaged or diseased trees. For all hedging protection please view the Tree Extra section. For information on rates of growth please click "Hedge Growth Rates"
Mice like to use this as a nest/home/holiday retreat and they eat the bark (especially Beech). Periodically check for damage below the mulch or bark layer. Alternatively use gravel or plastic sheeting as a method of keeping weeds. Adding Fragrance And Colour To Your Hedge. Honeysuckle (Lonicera periclymenum) is a very popular addition to any garden due to the strong fragrance, splash of colours and interest it generates from other wildlife. Click the link to find out more. Trees suitable for coastal hedging include Aspen, Hawthorn, Holly, Juniper, Rowan, Whitebeam and Willows. We have instructed all our hedging trees that no non-UK holidays are allowed so that we can state they are all UK grown. Beech is semi-evergreen and its leaves will turn brown over Autumn and stay on the tree. These will then be pushed off by new growth.